INDIANAPOLIS (July 15, 2013) — Klipsch, a leading global speaker manufacturer, announces today the appointment of Graham Rahal as an official brand ambassador. As a professional racecar driver competing in the IndyCar Series, Klipsch envisions a long-term relationship that seamlessly integrates Rahal into all facets of the brand. Rahal will be incorporated heavily into the product development and marketing efforts serving the brand itself, as well as its headphones and home audio products. Proving invaluable will be his youthful insight and guidance as Klipsch works to develop fresh, lifestyle-focused products that meet the needs of new demographics, while still incorporating the brand’s legendary audio performance. Graham Rahal is the youngest race winner in IndyCar history, which he accomplished in his IZOD IndyCar Series debut in 2008. He grew up in racing visiting tracks around the world and carries on a championship winning lineage from his father, 1986 Indianapolis 500 winner Bobby Rahal. Graham is a winner of the 24 Hours At Daytona, and the youngest Sports Car Club of America (SCCA) Champion in history. In addition, he continues to hold a number of racing records for his accomplishments at such a young age. Graham currently drives the No. 15 TBC Retail Group-backed Honda in the IZOD IndyCar Series for Rahal Letterman Lanigan (RLL) Racing. Today’s announcement follows a recent partnership with RLL. As the team’s official audio and headphone partner, Klipsch is highly visible among the team’s drivers, crew and at-track hospitality areas. The brand also supplies the race team with its latest headphones, enabling RLL guests to experience the brand's award-winning comfort and high-performance sound signature during each race weekend. In addition, Klipsch and RLL are collaborating on the technical development of the team’s race communications platform. 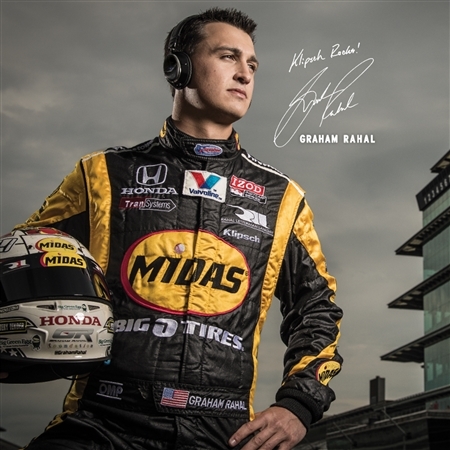 For more information on Graham Rahal, visit http://grahamrahal.com. For more information on the Klipsch brand and its product offering, visit http://www.klipsch.com.